Fighting in the dark has always been a difficult task in warfare, but with the invention of night vision, soldiers, sailors, and airmen can conduct their operations almost as well as they can during the day. 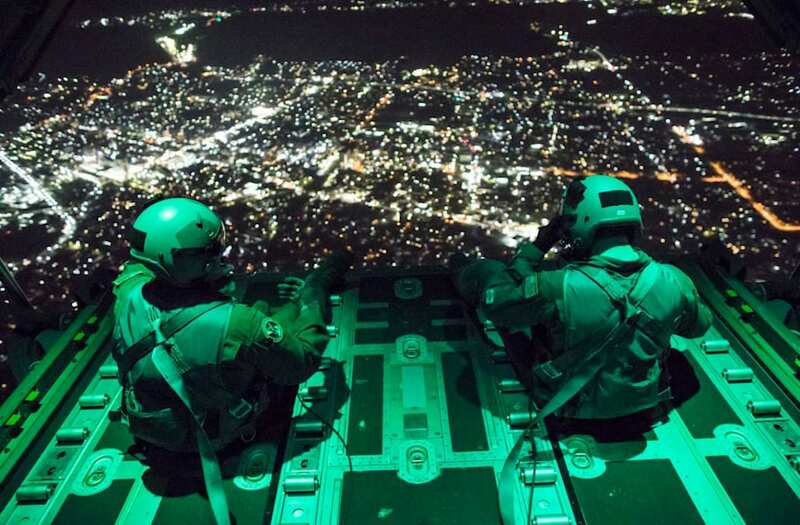 Photos captured while the US military performs nighttime training provide viewers with a unique look into the world of war. Military equipment, as well as the troops themselves, takes on a unique coloring when seen outside of the light of day. The US Navy guided-missile cruiser USS Monterey fires a Tomahawk land-attack missile. A C-130 Hercules from the 36th Airlift Squadron conducts a night flight mission over Yokota Air Base in Japan. Aircraft land aboard the aircraft carrier USS Enterprise during nighttime flight operations in the Arabian Sea. Capt. Thomas Bernard, a 36th Airlift Squadron C-130 Hercules pilot, performs a visual confirmation with night-vision goggles during a training mission over Japan's Kanto Plain. Canadian special operations regiment members call in close-air support from their US Air Force allies at Hurlburt Field in Florida. A US Air Force C-130 Hercules cargo aircraft with the 107th Airlift Wing fires off flares during a night-formation training mission. US Marines with Task Force Southwest observe their surroundings while at a security post for an advising mission with 1st Brigade, Afghan National Army 215th Corps as they conduct Operation Maiwand 12 at Camp Shorserack in Afghanistan. USS Ross fires a Tomahawk missile toward the Shayrat air base. Afghan and American special-operations troops destroy a Taliban weapons cache during a night operation in Ney Meydan, Sar-e Pul province, Afghanistan. Spc. Michael Tagalog, a US paratrooper, fires a Carl Gustaf recoilless rifle from an observation post in Afghanistan's Pekha Valley. The F-35 Integrated Test Force is completing a series of night flights, testing the ability to fly the jet safely in instrument meteorological conditions where the pilot has no external visibility references. US Marines with Task Force Southwest fire a 120 mm mortar as a show of force at Camp Shorab in Afghanistan. An F/A-18F Super Hornet assigned to the Swordsmen of Strike Fighter Squadron 32 lands on the flight deck of the aircraft carrier USS Dwight D. Eisenhower. Sailors recover combat rubber raiding craft with Marines assigned to the 31st Marine Expeditionary Unit during night operations in the well deck of the forward-deployed amphibious assault ship USS Bonhomme Richard. Aviation Boatswain's Mate (Handling) 3rd Class Kevin Williams directs an F/A-18C Hornet from the Warhawks of Strike Fighter Squadron 97 on the flight deck of the aircraft carrier USS John C. Stennis. Capt. Jonathan Bonilla and 1st Lt. Vicente Vasquez, 459th Airlift Squadron UH-1N Huey pilots, fly over Tokyo after completing night training. A 25 mm machine gun fires during a live-fire exercise aboard the amphibious dock landing ship USS Carter Hall. An AV-8B Harrier with Marine Attack Squadron 311 lands on the USS Essex. The pilots of VMA 311 were conducting night carrier landing qualifications in preparation for the 31st MEU's Certification Exercise. A Marine special-operations team member fires a M240B machine gun during night fire sustainment training in Helmand province, Afghanistan. An F/A-18E Super Hornet assigned to the Knighthawks of Strike Fighter Squadron 136 prepares to launch from catapult two during night light operations aboard the aircraft carrier USS Enterprise. A Marine from the 13th Marine Expeditionary Unit provides cover during a platoon assault exercise at Arta Range in Djibouti. Senior Airman Stephen Clark and Airman 1st Class Matthew Pfeffer, 36th Airlift Squadron C-130J loadmasters, on the open ramp of a C-130J Super Hercules flying near Yokota Air Base, Japan. Capt. David Hirt, left, and Maj. Stephen Piantarnida observe the terrain using night-vision goggles during an air-support exercise as part of a weapons and tactics course for instructors at Chocolate Mountain Aerial Gunnery Range in Arizona. LAV-25 Light Armored Vehicles from Charlie Company, 1st Light Armored Reconnaissance detachment, Battalion Landing Team 2nd Battalion, 1st Marines, 11th Marine Expeditionary Unit, fire on fixed targets as part of a combined arms engagement range during sustainment training in D'Arta Plage in Djibouti. Soldiers secure an area in view of the aurora borealis during night live-fire training as part of Exercise Spartan Cerberus at Fort Greely, Alaska. A Marine special-operations team member fires an AK-47 during night-fire sustainment training in Helmand province, Afghanistan.